Most everyone is familiar with traditional chiropractic adjustments, which temporarily correct minor misalignments in the spine or joints that cause interference to nerves (Subluxation). Subluxations result in all kinds of discomfort, including numbness and tingling in extremities, or pain in various places in the body depending on the location of the Subluxation. While a traditional chiropractic adjustment can provide temporary relief of these conditions, it doesn’t do anything to correct the root cause and chronicity of the problem, since it does not restore normal structural alignment. Chiropractic BioPhysics®, a relatively new but well-proven technique in chiropractic, addresses the limitations of traditional chiropractic care. 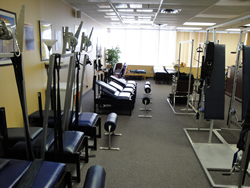 Dr. Paul Oakley, a chiropractor practicing in Newmarket, ON, has been using the Chiropractic BioPhysics® technique for chiropractic since 2003. What is Chiropractic BioPhysics® Technique? CBP® was invented in the early 1980s by Dr. Don Harrison. The goal of CBP® is to structurally rehabilitate the spinal alignment and optimize the posture of the patient. According to Dr. Oakley, “It is the most scientific and comprehensive way to correct someone’s posture and spinal alignment.” CBP® is based on the concept of “mirror image.” It stretches the spine into the mirror image or exact opposite of the bad posture, returning it to a normal position. CBP® uses three steps to accomplish spinal realignment in the patient, represented by the acronym EAT: corrective Exercises, corrective Adjustment techniques, and corrective Traction techniques. The traction stations look formidable. But they do the job and Oakley goes out of his way to make the office more like a spa than a typical doctor’s office. When patients come in for a treatment involving CBP®, they lie down on the warming tables to relax the muscles. Then they get adjustments and/or traction, depending on their specific needs. Following that, they do their exercises. The last step is to ice the muscles, and no one leaves until the doctors at the clinic are satisfied that the patient has received optimal treatment. What are the Benefits of Chiropractic Care with CBP®? Oakley participated in the International Chiropractor’s Association’s Best Practices and Practice Guidelines committee that summarized every article ever published since 1895 about chiropractic care helping or curing all sorts of diseases and ailments. He says that these clinical studies number around 1,500 and mentions that, “There’s been eyesight cured, asthma, there’s been — you name it, it’s been done.” Oakley reiterates, though, that the one thing that traditional chiropractic does not do, is routinely rehabilitate the spine and posture into normal alignment, and that is where CBP® comes in. Patient resources are available online to locate a chiropractor trained and certified in CBP® in your area. The Chiropractic BioPhysics® Patient Resources website provides a search function that allows you to search either in the United States or internationally. However, when I used the international search function to test it out and see if I could locate Dr. Oakley in Newmarket, Ontario, I was able to get results when I used only City and Province in the search form. When I included my postal code, the search returned zero results. According to Oakley, there are hundreds of chiropractors that use CBP® around the world. It is most popular in the United States. In Canada, there are only 31 CBP® certified chiropractors. So, in Canada, it may be difficult at this time to find a chiropractor with CBP® certification in your immediate area. Chiropractic BioPhysics®, or CBP®, addresses the shortcomings of traditional chiropractic. While traditional chiropractic adjustments address pain and can help alleviate or cure a variety of symptoms and conditions, they often do not address the fundamental underlying structural cause of the pain or conditions. Chiropractic BioPhysics® technique fills in this gap and can be a life-changing measure for anyone suffering from postural misalignment. Chiropractic BioPhysics Online (Accessed February 25, 2011). International Chiropractic Association’s Best Practices and Practice Guidelines. (Accessed March 1, 2011). Oakley, Paul, D.C., Innovative Spine & Wellness and Scoliosis GTA (Accessed February 25, 2011). Oakley PA, Harrison DD, Harrison DE, Haas JW. “Evidence-based protocol for structural rehabilitation of the spine and posture: review of Clinical Biomechanics of Posture (CBP®) publications“, Journal of the Canadian Chiropractic Association 2005, 49(4):270 – 296. (Accessed February 25, 2011).